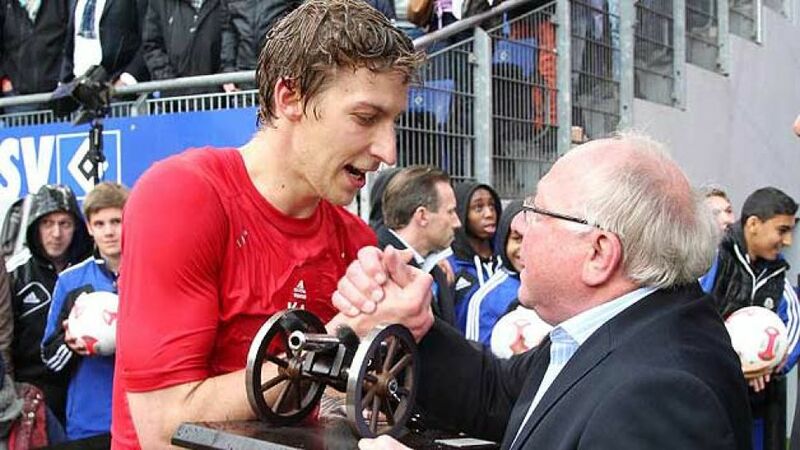 Hamburg - If possible, Stefan Kießling would have hugged everybody. His teammates, all the rest of the club staff, even the assembled representatives of the press got the high-five treatment from the Bayer Leverkusen frontman amidst the celebrations in the wake of the 1-0 win at Hamburger SV on Matchday 34. Kießling's last-gasp match-winning strike had just secured him the Bundesliga top-scorer's cannon for 2012/13, one goal ahead of Borussia Dortmund's Robert Lewandowski. He is only the second Bayer player to win the coveted award after Ulf Kirsten, who pulled off the feat three times, but the freshly-crowned winner's 25-goal tally does take him ahead of his legendary predecessor as the club's one-season record holder. "The cannon's going into the children's room," Kießling grinned after taking reception of a trophy that has been a long time coming. Indeed, the rangy 29-year-old striker only missed out on a share of it on the final matchday back in 2009/10, when VfL Wolfsburg's Edin Dzeko grabbed his own 22nd of the campaign to edge 'Kieß' into second place. Born in the small town of Lichtenfels in Upper Franconia, Kießling's first posting as a professional was with regional heavyweights 1. FC Nuremberg. He made his Bundesliga debut in April 2003, coming off the bench at the very stadium in Hamburg where he would win the cannon a decade later. After der Club were relegated to the Bundesliga 2, he gradually established himself in the first team, helping Nuremberg bounce back to the top flight at the first attempt. A ten-goal haul in 2005-06 was enough to convince Michael Skibbe, Leverkusen's coach at the time, to bring him on board at Bayer. "Moving to Leverkusen wasn't an easy decision, because I really enjoyed it at Nuremberg. But to be honest, it's the best decision I ever made," Kießling reflected later. Seven seasons down the line, he has 98 goals on his Bundesliga account for Bayer, an excellent return from 220 appearances. The fact that he has only turned out six times for Germany over the same period is an ongoing bone of contention within the country's football community. "The competition's never been as fierce in the past 50 years. We have an incredible number of good forwards at the moment. But the World Cup finals are still a year away - and should anything happen the national team coach knows he can find a top-drawer striker in Leverkusen," says Bayer sporting director Rudi Völler, himself a man who knows a thing or two about putting the ball in the back of the net, having scored 47 goals in 90 games for die Nationalmannschaft. Not that Kießling's qualities are by any means confined to the penalty box. Another reason for his popularity in the team is his sterling defensive work. "He's the complete forward. He really puts in the legwork and he's really helped us qualify for the Champions League," Bayer's Spanish right back Daniel Carvajal told bundesliga.com. True to form, Kießling is all too happy to return the compliment. "The way everyone else celebrated winning this trophy along with me made it really special. It's not just mine, it belongs to the whole team." Recipes for Success is the title of a cookbook Kießling released in 2012, first privately and then through a publisher. As far as his own sporting achievements go, however, the hobby chef has a simple formula: "You start afresh every time. When the pre-season preparations get underway, I have to prove myself all over again. But anyone who knows me knows that I'll do anything to help my team be successful."